Taonga was hatched in 2011. A female kakapo chick is very valuable to the future of the kakapo as a species. As a three-year old chick, she was routinely monitored via her transmitter backpack and various weighing stations. A loss of weight was noted, and rangers were sent out to bring her back. At the headquarters, she was examined and found to be severely underweright and in poor body condition. She was palced in the care facility, and a series of diagnostic tests were collected. 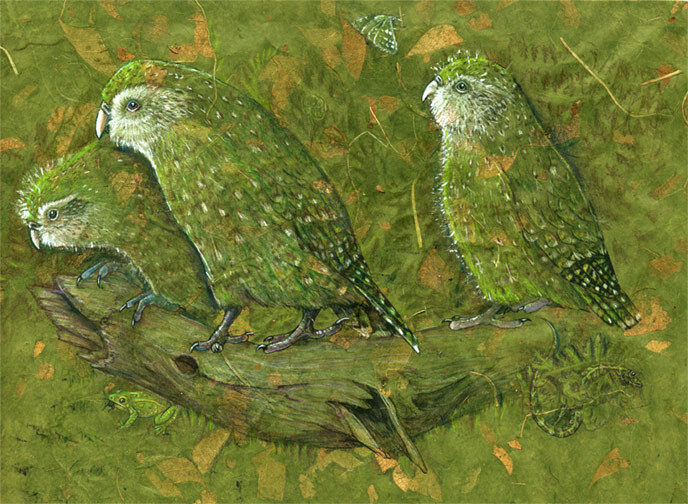 The kakapo is such a unique parrot. There are so many attributes that distinguish this species from all others. The lovely plumage is the first thing to be noticed. Yes, that's right. HOT CHICKS! Unseasonably warm and fine weather on Whenua Hou has brought sun-loving people outdoors, sandflies in numbers, and minor inconvenience to the babies in the rearing unit. Contrary to everything known about baby birds, and to incubating and hand-rearing baby parrots, Kakapo chicks need to be...COOLED! Kakapos are adapted to cold temperatures, and as the chicks grow and are able to regulate their own temperature, warm weather can bring stress. At long last, the day has come to depart for the beautiful sanctuary island of Whenua Hou.The day dawned clear and cold in Invercargill, open skies with whispy cirrus clouds. No wind! The first stage was arrival at the quarantine store, where all gear, persons and supplies were minutely inspected for seeds, soil, rodents, insects and other contamination. The entire process for 2 volunteers was about two hours. The boys are a-boomin’ the girls are a-choosin’, and the season is a cruisin’! There were rumors, late in 2013, that the precious rimu trees might produce a good crop this year. On Whenua Hou, the available rimu mast is what triggers females to have a good breeding season. And indeed, somehow the males are attuned to this chord: the boys were a-boomin' this year!